“How to” and “how not to” debate. Mrs. Dobell and Mr. Mogg debate KIPP’s no sandal policy. Directions: You will need to take into consideration the roles and responsibilities of each speaker and the function of their speeches in a debate. These speeches are presented by the first Team A and the first Team B speakers. The main responsibility of this speaker involves: introducing the topic in an attractive and interesting manner, defining the main terms (like racism). You can also outline what sources your teammates are using. During speeches, the third speaker on the team develops the arguments presented. He/she responds to the arguments presented by their opponents – both attacking arguments as well as re-building their teams’ cases. These are usually the last speeches in a debate and their function is to summarize the main points and conclude the debate for each side. The last speakers have the last opportunity to demonstrate to the judge(s) or the audience why their team should win the debate and finish their respective speeches with a powerful conclusion. Refutation (Taking notes of what has been said and what has not by both sides. With the exception of the speaker opening the debate (1st speaker) all speakers participating in a debate should be ready to not only support the arguments prepared by their teams (through the process of research, argument and debate case development) but also critically respond. Directions: You will be arguing your side, persuade teammates. Take time to make sure you understand your side of the argument and are prepared for what the other side will say (this will help you be better prepared for the rebuttal). Respect for other team All statements, body language and responses were respectful and were appropriate in language. Statements were respectful but once or twice body language was not. Statements and/or language were borderline appropriate, some sarcastic remarks. Information All information presented in this debate was clear, accurate and thorough Most information presented in the debate was clear and accurate but, was not usually thorough. There were some accurate statements, but presenter was silly and it caused inaccuracies. Use of Facts Every major point was well supported with several relevant facts and/or examples. Every major point was supported with facts and/or examples, but the relevance of some was questionable. Some points were supported well, others were not. Rebuttal All counter-arguments were accurate, relevant and strong. Most counter-arguments were accurate, relevant, and strong. Some counter arguments were weak and irrelevant. Presentation Style Team consistently used gestures, eye contact, tone of voice and a level of enthusiasm in a way that kept the attention of the audience. Team usually used gestures, eye contact, tone of voice and a level of enthusiasm in a way that kept the attention of the audience. One or more members of the team had a presentation style that did not keep attention. 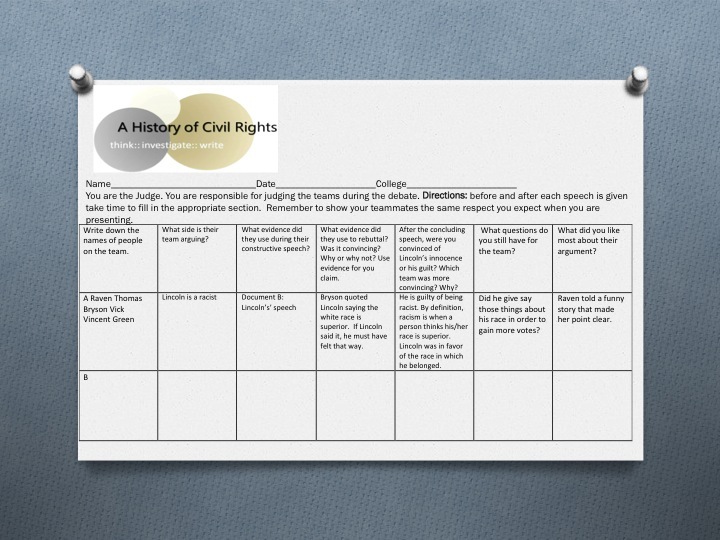 Presenters will be able to debate their side of the issue using evidence from primary source documents. Each team will give a opening, rebuttal and closing argument. Audience members will be able to analyze both sides of the debate and determine which team used the most convincing evidence. Audience members will be required to fill out a chart. You are the Judge. You are responsible for judging the teams during the debate. Directions: before and after each speech is given take time to fill in the appropriate section. Remember to show your teammates the same respect you expect when you are presenting.